Have you ever done something that hurt someones feelings? Have you ever not paid attention to your word delivery? Have you ever been inconsiderate? The answer is yes, we all have. The beauty of life and life choosing God is that all of this can be forgiven. We are not judged for our idiosyncrasies. We are judged by our hearts and our works. Meaning God understands our humanness. It is mankind that needs to stop being so judgemental. 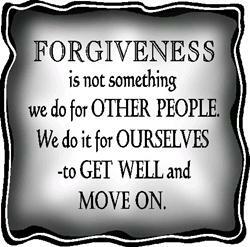 It is mankind that needs to forgive. We as humans cannot go through life harboring ill feelings. We cannot hold on to the past no matter how painful. 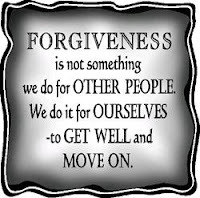 At some point forgiveness has to take place. The result of not doing so leads to so many, many things. In the book of Kings you find Saul turning so bitterly angry and jealous of David that he pursues him, and tries to kill him. David on the other hand remembers in his heart that Saul has no reason to feel this way. On many occasions David could have ended the pursuit and killed Saul. But he did not. He forgave him, he let him go. Saul ended up falling on his own sword. God wants us to know him. God loves us unconditionally, without question. Without holding us accountable. We simply have to give our pain and misery to him. Through Jesus Christ death; our pain and suffering was taken care of.